Review note: My initial impressions of the sound of the On1 are based on direct comparisons to other headphones — in particular the Shure 1540, B&O H6, B&W P7, Sennheiser Momentum On-Ear, and notes I’ve accumulated from many prior reviews. I describe how I relate to the On1 (i.e., my personal tastes and how I use the headphone) after covering all of the objective issues. First impressions of the Thinksound On1: A slightly emphasized bass, with neutral and detailed treble, and a slightly forward perspective in voices and midrange instrumental sounds. Comparing headphones isn’t easy because no two signatures match. Even if the midranges of two different headphones sound similar, just play a variety of music tracks and you’ll find that headphone A’s midrange may sound more forward than headphone B on one track, while the reverse is true on another track. That’s because the output of each headphone varies with frequency and those variances never match exactly. There are a couple of things I listen for to evaluate the quality of the sound. The first is the smoothness of the frequency response (signature), and the second is tonal qualities: how well the headphone reproduces instrumental and vocal sounds through the characteristic harmonics of those instruments and voices. Soundstage is another variable with headphones. Most reviews express soundstage as a single quality: it’s good, not so good, very good, or similar. The On1 has a very smooth signature, lacking any significant peaks and recesses that would make some recordings sound better or worse than others, even when they’re of equal quality. 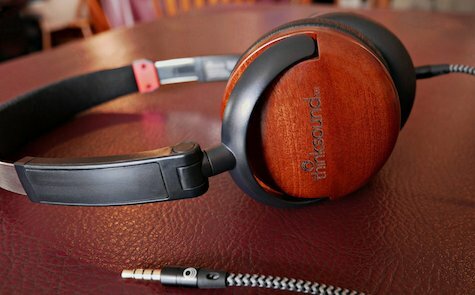 The On1’s tonal qualities are excellent, which I’ve come to expect of the better wood-cup headphones. I’ve had the Grado PS500, the ATH ESW9a, and ESW11Ltd, for example, and the On1 gives up nothing to those items. The On1’s soundstage doesn’t seem especially large on the variety of music tracks I play, which I would expect given the small-ish earcups and the on-ear design. But given that expectation, the On1 delivers what’s actually in the recording, and I don’t sense that I’m missing any positional information that would be lost if the headphone didn’t provide optimal separation of instruments and voices. The bottom line for my hopefully objective view of the On1 is a high-quality sound that plays well on small music players, but will reveal much greater musical detail with better DACs and headphone amps. There are many headphones that don’t “scale up” or improve more than a minimal amount with the better amps, simply because they aren’t much better than the portable music players they were designed for. The On1 headphone will scale up higher than most users will want to spend, and that’s a type of “headroom” that the On1 provides for future upgrades. Unlike many reviewers who report the headphone’s sound “out of the box” and leave it at that, I encourage users to experiment with different music players and amps as well as the tone controls and other adjustments they provide, in order to get the absolute maximum of musical enjoyment they can. That beats chasing after numerous alternatives in hopes of finding some ideal sound, or a perfect match to personal tastes that doesn’t exist. The On1 build quality looks great to me; as good as I’d need for any use I might have. The metal headband stretches very wide, yet the clamping force is modest. Combine that relatively light clamping force with the soft squishy earpads and you get a very comfortable fit. I’ve had on-ear headphones with earpads that don’t seal well to my ears, especially in cold weather, but using the On1 in mid-30’s Fahrenheit temperatures recently, I’ve found it to work perfectly without losing any of the important bass tones that get lost when earpads don’t seal well. The headband is covered in a fabric with some of that squishy foam underneath, but for users who have problems with any headband pressure, I recommend pulling the earcups down a notch or two to allow the earcups to support more of the headphone’s (light) weight, relieving the headband from carrying the majority of that weight. The 4.5-foot cable is single-sided, detachable, and plugs into the right earcup. The earcup connector is a standard 3.5 mm miniplug, and it appears that a common generic cable could be used to replace the On1’s cable if necessary. Two cables are supplied: one with the standard miniplugs and one with an Apple-style plug that is supposed to work with i-devices as well as Android players. The latter cable contains a microphone as well as a stop-start button. My most important qualifier for portability is to be able to pull the earcups down and wear the headphone around my neck all day when not listening. Folding the earcups flat, the On1 becomes a perfect portable headphone. The impedance is 54 ohms and my tests show that it’s very efficient, so I’d expect uniform performance on nearly any music player or headphone amp, with the only difference being the improvement that a decent DAC and headphone amp brings to the sound. The isolation is very good (better than average for a closed headphone) and the leakage is very low. If you’re in a very quiet office in a cubicle right next to other cubicles, the adjacent co-workers won’t likely hear any of the sound unless played at extremely loud volume levels. The carrycase is a cloth bag, which I wouldn’t use without additional protection when placing the headphone into a backpack or luggage where it could sustain impact damage. My summary of the On1’s sound (my subjective opinion) is that it’s marvelous, in a word. I know of one much more expensive headphone in my small collection that might remain my first choice for home listening at my computer desk, but the On1 will get more use anyway, since it serves as my preferred portable as well as being more flexible for use at different places around the house. MyMac Review Rating is 9 out of 10, with a recommendation. In previous reviews published elsewhere I’ve included the following music examples with comments about how the headphones sound with each track. My suggestion is instead of reading each one as an absolute unto itself, you could compare my notes here to those other reviews and see how the On1 compares with each individual track. Ana Victoria – Roxanne (Pop Vocal): Spacious sound, good bass tone and impact, and the vocal sounds very natural. Excellent reproduction by the On1. Ben Goldberg – Root and Branch (Jazz): Realistic you-are-there sound with great instrumental reproduction. The On1 plays this extremely well. Benedictines Of Mary – O Come Emmanuel (Medieval/Female Choral/Acapella): Very spacious sound and natural reverb for a large recording venue (cathedral). The On1 makes the voices come alive. Black Sabbath – Iron Man (Classic Rock): Excellent instrumental detail – the vocal sounds very natural. As with most classic rock tracks, there is very little or no deep bass. The On1 plays this music very smoothly, and the lack of deep bass doesn’t unbalance the treble. Candy Dulfer – Lily Was Here (Jazz): Narrow soundstage, but excellent detailed instrumental tone. The On1 gives this a reasonable sense of space, but in spite of being a modern recording, the net effect is only slightly better than enhanced mono. Cantus – Danny Boy (Traditional/Male Choral/Acapella): The On1 plays the voices with enough low end warmth and weight to sound very natural. In spite of my impression that the On1 has a strong bass, there is no exaggeration of the low end of the male voices on this track. Chris Isaak – Wicked Game (Pop/Rock): The On1 plays this high treble energy recording with perfection – the voice and instruments are highly detailed but very smooth. Daft Punk – Lose Yourself to Dance (Electronic/Disco): Less than hi-fi quality recording, but the voices are very good. There’s a decent amount of bass impact, but the bass doesn’t have much detail. David Hazeltine – Fur Elise (Jazz): A very high-quality recording from HDTracks. The On1 reproduces the instruments perfectly with a you-are-there ambiance. The wire-brush-on-cymbal harmonics are very extended and detailed. David Lynch-Lykke Li – I’m Waiting Here (Soundtrack/Vocal): Dark, moody song – Lykke’s voice is very detailed, the strong bass impacts are very good, but most of the instrumentation is soft and kept in the background. The On1 plays this music very well given the sonic limitations. Dream Theater – Take The Time (Metal): The sound quality here is limited, but the On1 is smooth enough to bring out the details in this very busy music without verging on harshness. Genesis – Follow You Follow Me (Pop/Rock): The On1 plays this old and less-than-ideal recording well enough to enjoy, but the soundstage is fairly narrow. Giant Drag – Wicked Game (Pop/Rock): Annie Hardy’s version of the Chris Isaak hit has a lot of energy, but the quality is limited – still the On1 pulls out enough detail to be a pleasant listen. Grieg (Beecham-Royal Philharmonic) – Peer Gynt-Solveig’s Lullaby (Classical): This very old (late 1950’s) stereo recording must have been made on the most expensive gear in the world, since the overall sound quality and especially Ilse Hollweg’s amazing voice are as close to “being there” as I’ve heard with some of the better classical recordings made since the year 2000. The On1 makes this an outstanding listen. Hubert Kah – The Picture (New Wave): This track has great bass detail and weight at the same time, which I find unusual for this type of 1980’s pop music. The On1 plays this music very well. Hugo Audiophile – 15-16 (Electronic): I’m not sure what the 15-16 stands for – perhaps track numbers from a CD album. The strong deep-bass tones that start around 33-34 seconds into the track reproduce very well with the On1. This is a great recording for evaluating whether a headphone’s bass will be sufficient for most environments, since for many headphones that have a weaker bass, the deep bass gets absorbed and mostly lost when the environment contains a lot of low-frequency energy. Korn – Another Brick In the Wall (Rock): Aggressive rock that’s very satisfying for hard-rock fans. The On1 plays this perfectly, which is to say, with proper edginess and bass impact, yet without unintended sonic harshness. Kunika Kato – Fur Alina (Vibraphone): A very unusual instrumental – the tone quality is unlike anything I’ve heard before. Recording close-up is part of the magic here, but the On1 does the rest in reproducing the full harmonics of this amazing instrument. Michael Buble – Nice ‘n Easy (Easy Listening/Jazz): This is the only track I own by Michael Buble, but it’s a great recording and vocal performance. The sound of the backing band here is rendered extremely well by the On1, and the voice isn’t pumped up for Loudness Wars thankfully. Michael Tilson Thomas – Rhapsody In Blue (20th Century Classic): Great sound and soundstage, and terrific piano playing and tone, brought to life by the On1. There are some very deep bass impacts starting around 38 seconds into the 17:24 length track, and those impacts have an impressive weight with the On1. Muse – Madness (Rock): The bass in this track has great impact and detail with the On1, and although the voice is somewhat forward, it doesn’t interfere with my appreciation of the bass line here. Phaeleh – Afterglow (feat. Soundmouse) (Electronic/Vocal): The instrumental sounds that begin this track are played very nicely by the On1, but the voice tends to overwhelm those background sounds – until the heavy bass impacts kick in. If there is any doubt about whether the On1 will play heavy impactful bass with good detail (if such sounds are really in the recording), this track is the proof. If you were to begin your On1 listening with this track, you might think you were listening to a headphone that has a very boosted but tight and detailed bass. Simply amazing. Richard Strauss (Mester-Pasadena) – Also Sprach Zarathustra (opening) (Classical): The granddaddy of bass is in the opening 1:50 of this recording, and I’ve heard it only once on a large and expensive loudspeaker system in Cleveland. For most people, that experience would be indistinguishable from being in a fairly strong earthquake. The On1 conveys as much of that experience as is possible on headphones. The tympani also have excellent impact here. Sargis Aslamazian – The Sky is Cloudy (Classical/Armenian): The National Chamber Orchestra of Armenia has a great classical program, and the On1 plays this music with good separation, tone, and big-orchestra precision. Satri-Tomoko Sonoda – All The Things You Are (Jazz): This track came from Bakoon Products, who make high-quality audio amplifiers. There’s a lot of upright bass plucking in this track, and the On1 plays it well, although it’s recorded pretty close-up and may sound somewhat boomy at times. Tommy Smith – Johnny Come Lately (Jazz): Small-combo jazz – sax, piano and drums. The sound is fairly close-up but well-recorded, and sounds very nice with the On1, although the wire-brush-on-cymbal harmonics are not as extended as on the David Hazeltine track above. 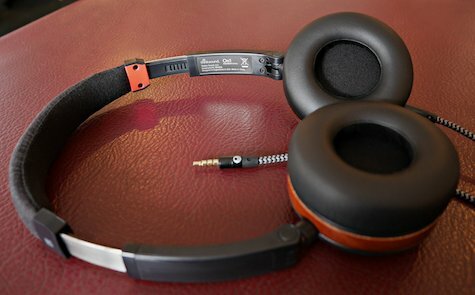 Some of my prior headphone reviews, for reference purposes.